Featured image: Microwear analyst Marilyn Shoberg examines a stone tool under a microscope in the TARL laboratory. She typically makes observations at magnifications ranging from 50X to 500X and captures potentially diagnostic wear traces with a digital Moticam camera. 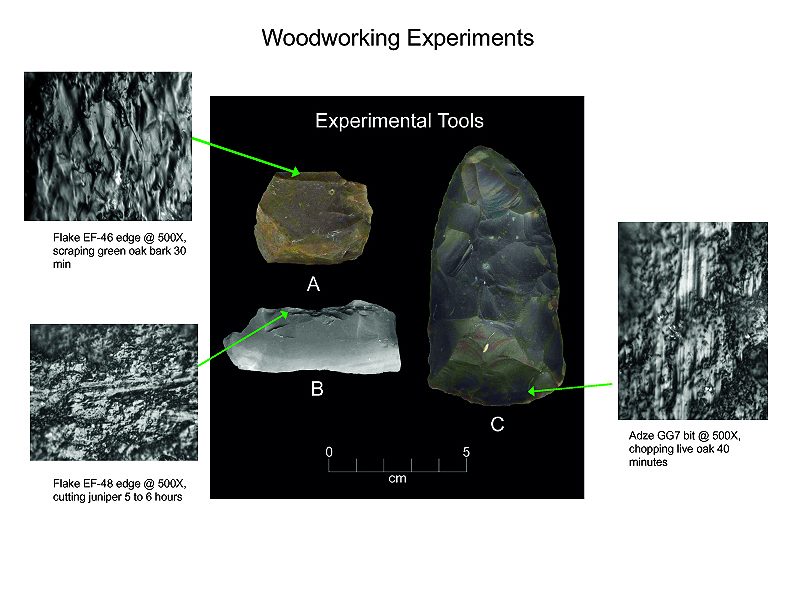 After receiving my MA in Anthropology from UT-Austin, I joined the Gault Project at TARL in 2000 and began doing microwear analysis, looking at experimental tools and archeological tools from the Gault Site. Some of the stone artifacts in an archeological assemblage are formal tools that have recognizable shapes such as projectile points, bifaces, or endscrapers. Many more artifacts appear to have been used, however, and unless we look at them under the microscope we can only guess at what their function may have been. When a stone tool is used the edge is gradually worn away by the loss of flakes and abrasion, and the surface is modified by contact with the worked material so that it appears shiny or polished. 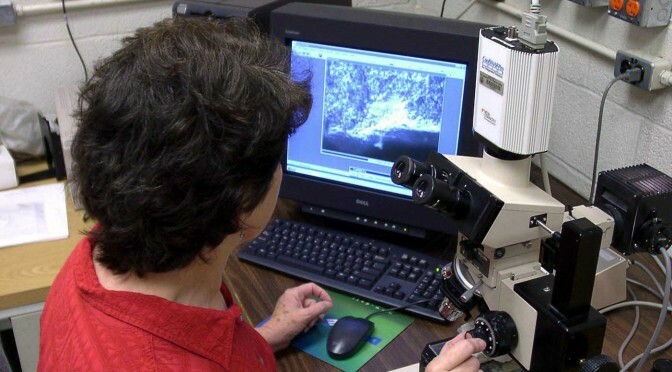 Microwear analysis is a systematic process of recording wear traces such as edge flaking, the surface characteristics of polish, and the orientation of striations on a stone tool in order to determine how that tool was used. The research microscope used at TARL for this analysis is an Olympus BH2 reflected light microscope with Nomarski optics. Observations are made at magnifications from 50X to 500X. Images of potentially diagnostic wear traces are captured with a digital Moticam camera. Microwear analysts learn how to identify the various attributes of wear traces by looking at experimental tools used in many different tasks on a wide variety of materials. It is absolutely essential for every analyst to do experiments and to acquire a reference collection of tools used in tasks relevant to prehistoric human behavior. The comparative collection of experimental tools we have at TARL is a terrific asset for analysis and teaching. It has grown from the work of many former students here at UT, archaeologists and friends of archaeology. The collection includes tools used on plant materials, several kinds of wood, bone, antler, elephant ivory, hide, and butchering a variety of animals. In addition to a large number of Clovis tools from the Gault Site, I have analyzed artifacts from a number of CRM projects in Texas, and sites in Arizona, Illinois, New Hampshire, Kentucky and Belize. In archaeology we attempt to understand past human behavior from material culture, however only a very small fraction of that material culture survives. The things that people made from perishable organic materials such as plants, wood, bone, and skin are for the most part missing from the archaeological record. The fascinating aspect of microwear analysis is that the tools used in the manufacture of the “missing majority” of that perishable material culture provide clues to the kinds of things people were making at particular places. Among the most interesting tools I have looked at are a small Clovis age flake used to incise bone, tools used to pierce animal skin, perhaps in the manufacture of clothing or shelter, and small prismatic blade fragments used in fine cutting or scraping tasks on grass, reed and wood. Sometimes you find an example of a recycled tool like a used-up projectile point re-purposed as a scraper or abrader on animal skin.